“When I write I can shake off all my cares; my sorrow disappears; my spirits are revived.” From Anne Frank's Diary, 5th April 1944. “Words can make a difference-both for good and evil” . 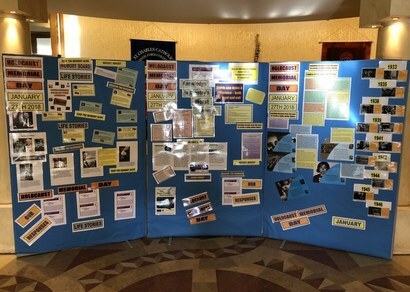 A group of students from the College’s Learning Support Department prepared a stimulating and educational display to commemorate Holocaust Memorial Day. The date is marked on the 27th January every year, the date when Auschwitz – Birkenau, the largest concentration camp, was liberated from the Nazis in 1945. The display was mounted in the College Atrium and had a wealth of information relevant to the Holocaust, Nazi persecution, and each subsequent genocide’ Rwanda, Cambodia, Bosnia and Darfur. Life stories of those who were murdered, of survivors, rescuers and witnesses were posted giving a unique insight into their experiences. This year’s theme; the Power of Words explored the impact that words had in the Holocaust and subsequent genocides “through propaganda used to incite, through slogans written in resistance, and through memoirs written to record and respond to what was going on."